This week was again a short week, due to the New Year’s holiday. But we still found time to extract more spam emails. Two more scam survey emails turned up, Commonwealth Bank customers were targeted by phishing emails, as were Google+ users. This week we extracted a Kmart scam survey email. In this one, the recipient is informed that they can win a $50 gift voucher from Kmart, if they simply fill in a survey. The second email offers the recipient the chance to win a $150 Target voucher if they answer one question (initially that is). Bother these emails lead the user to a phishing site that is designed to extract a wealth of personal information about the user, including credit card details. 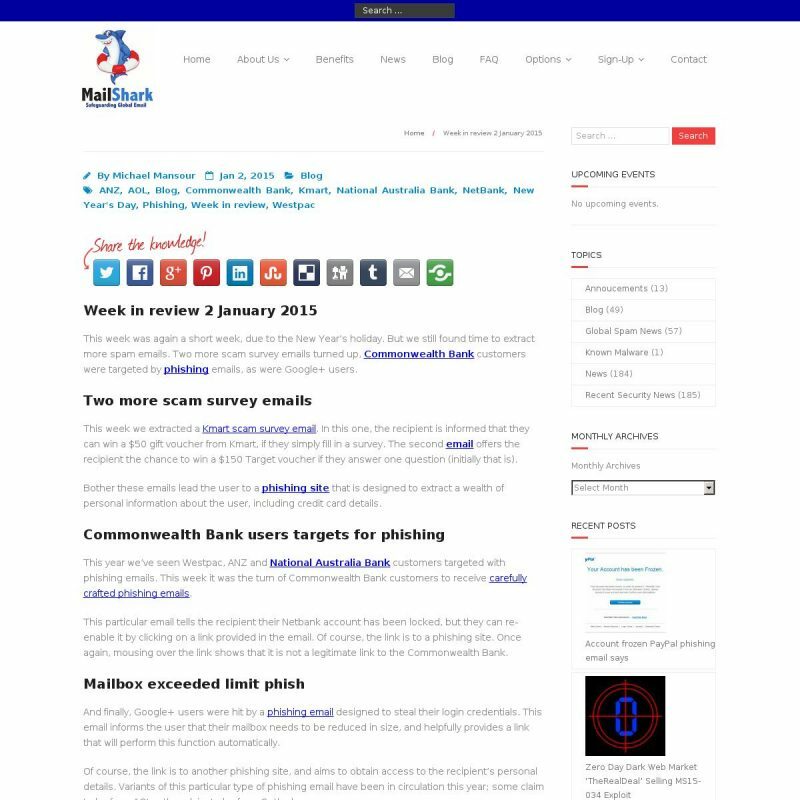 This year we’ve seen Westpac, ANZ and National Australia Bank customers targeted with phishing emails. This week it was the turn of Commonwealth Bank customers to receive carefully crafted phishing emails. This particular email tells the recipient their Netbank account has been locked, but they can re-enable it by clicking on a link provided in the email. Of course, the link is to a phishing site. Once again, mousing over the link shows that it is not a legitimate link to the Commonwealth Bank. And finally, Google+ users were hit by a phishing email designed to steal their login credentials. This email informs the user that their mailbox needs to be reduced in size, and helpfully provides a link that will perform this function automatically. Of course, the link is to another phishing site, and aims to obtain access to the recipient’s personal details. Variants of this particular type of phishing email have been in circulation this year; some claim to be from AOL; other claim to be from Outlook. If you receive any of the email mentioned this week, delete them. They are phishing emails.